Cigar smoking isn’t a habit like cigarette smoking. The best cigars are like a fine wine. The way they are prepared and the kind of tobacco used is important. But all of this flavor and sophistication can’t remain intact forever. The forces of the world act on a cigar and the materials begin to break down. If left out in the air, a cigar will desiccate and eventually fall apart. Of course, left for enough time, anything falls apart with age. And that’s why we invent ways to preserve what we own or create. In the world of cigars, the humidor is our way of preserving cigars. And contemporary humidors take advantage of technology to preserve quality cigars longer. If you are a cigar aficionado, you probably have been on the hunt for the best cigar humidor for a while. A mere cigar box won’t do. You need something that keeps your cigars in excellent shape. This is why we’ve created a guide to help you find the best. Scroll onwards for more. Humidors are boxes designed to keep the inside of the box at a perfect humidity level for cigar preservation. But not all cigar humidors have the same humidifier inside. What are the different types of humidifiers you can find? There are four main types and they each have their perks and their downsides. These are most likely the most accurate humidifiers you could buy. And accuracy is a must if you really want to keep your cigars at the perfect humidity. What is the perfect humidity? About 70% give or take depending on the cigar’s origin. The only downside of an electronic humidifier is price. It’s typically more expensive than other options. And it needs a power supply, usually a battery. Batteries do have to be changed and you may not smoke your cigars enough to notice when the battery dies. Gel humidifiers are cheaper than their electronic cousin. And they’re fairly accurate. They do need to be refilled, but you will be able to keep this in your calendar unlike not knowing when a battery will die. The only real downside to the gel humidifier is how much space it takes up in your humidor. Even the best cigar humidors only have so much space and how much space you need depends on your collection. This is the cheapest of all the humidifiers. But it requires frequent refills and it’s definitely not very accurate. But it’s fairly low-tech, so if you don’t care too much for technology you should buy one of these. These are the traveling humidifiers. If you’re moving across the country or heading over to Spain to participate in a civil war, you’ll want to use this temporary humidifier. Which you choose depends on your budget and your needs. If you need more room in your humidor, go with a low profile electronic humidifier. If you are on a budget and don’t care too much about accuracy, go with the green foam. Humidors don’t always come with a thermometer. And if it weren’t for the tobacco beetle, we wouldn’t care much about temperature. If even one cigar contains tobacco beetle larvae, any temperature above 72 degrees Fahrenheit will allow them to hatch and infest the rest of your stash. If you’ve put a bit of money into your cigar collection, you might want to protect it with a thermometer. Make sure you keep that temperature perfect or you’ll be smoking money instead of cigars. A hygrometer is the only way you will know exactly how much humidity is inside your humidor. While the electronic humidifiers might include a hygrometer, anything else will lack one. Of course, you could do without a hygrometer and try to figure out humidity by touch. But the more you handle your cigars without smoking them, the more likely they are to break down. There are two kinds of hygrometer: digital and analog. Digital hygrometers are going to be the easiest to read. They don’t require any manual calibration, unlike their analog friend. The best cigar humidors fit your needs and your taste. And we’ve considered two here for you as well as the pros and cons of each. 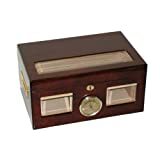 If you’re the kind who likes to show off your cigars, you might want this humidor. Keeping your cigars safe while still making sure your guests eye them would be tough without a glass top. And this humidor can hold up to 100 cigars in four compartments so it’s fairly large to boot. It’s made of glossy cherry and it’s adorned with a bronze lock and hinges. It also comes with a hygrometer that’s set into the face of the box. A few units have had seal problems. But the percentage is small. And you might want to replace the hygrometer as it’s not always the most accurate. The humidifier is not included. Our second pick is another glass top. This one is a tad more expensive. But it holds 20 more cigars than the Mantello. You can choose between an analog or a digital hygrometer. And it features several cedar trays for easy sorting. The humidifier is included. And it works well enough if the humidor remains sealed. And while it’s aesthetically pleasing, this humidor does sometimes come with sealing issues. Again, this is a small percentage that typically happens during manufacturing. And you have to calibrate the hygrometer as it’s not calibrated before it’s shipped. While the selection might be broad, the choices are actually few. 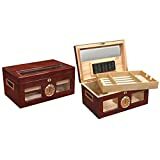 The best cigar humidors give you plenty of room to sort your cigars and they’re elegant and well made. If you’re new to cigar smoking, check out our tips on cigars and humidors.